Item citation: from folder 3 in the William Ray Wells Papers #2960-z, Southern Historical Collection, The Wilson Library, University of North Carolina at Chapel Hill. This entry was posted in Southern Historical Collection and tagged William Ray Wells. Bookmark the permalink. Fascinating stuff! I’ve read a LOT of letters/journals fromt his period (research for my book on the 1st Minnesota regiment during Gettysburg – pub. 2002) and have discovered how useful a “second pair of eyes” can be in deciphering handwriting of the period. 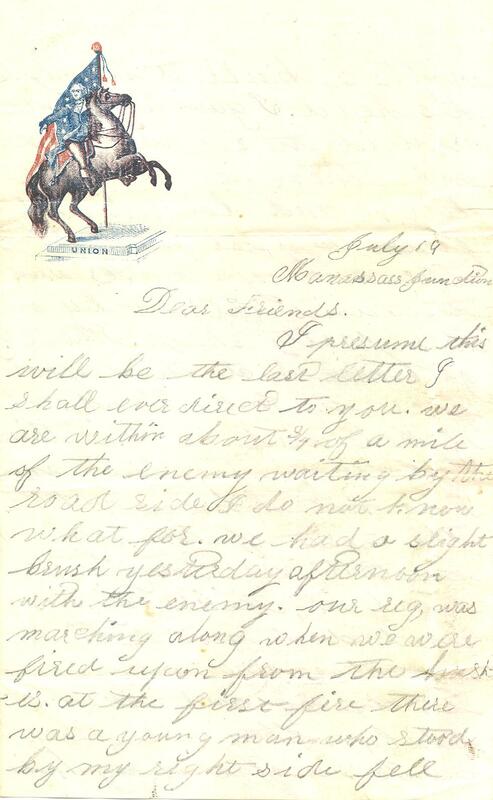 I offer a few suggestions/considerations about transcription: 1) Regiments did not have a “Company P” – the letter appears to be an “A,” with the looping flourish of 19th century handwriting. 2) He didn’t cap the letter “u” in the opening of the sentence “us that were together stood it,” but you’re right – the word is “us.” 3) You’re right on your transcription of the sentence “We are expecting to attack them now soon.” He would have made more sense to have put a comma after “now,” but the “now, soon” is clearly the way he talked, so he wrote it that way. He spelled “attack” as “attact” – but “attack” is what he was intending. 4) Your sentence: “I have not read my letters from any of you …” should be “I have not rec,d (received) any letters from any of you …” I’ve seen that contraction for “received” in other letters/documents of the period. 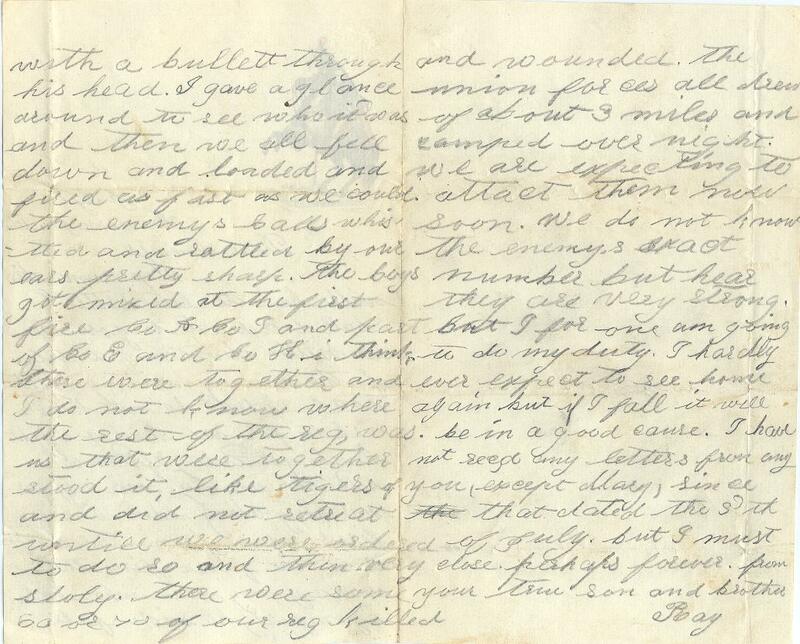 Not getting mail is the lament of every soldier from every war – they often mentioned it, either thanking for the letters, asking to be written to more often, or – like this fellow – reminding family that they want to receive letters and haven’t. Great stuff! Thanks for posting/transcribing this. Thank you, Mr. Leehan, for your notes on our transcription. We appreciate the assistance. I agree with your notes and I have updated the text to reflect these suggestions. Unfortunately, due to time constraints in this project, we often must make a quick pass at transcribing the material. In fact, we had not originally intended on including transcriptions in our presentation of these items. However, we will make every effort to transcribe, when and where possible. All that to say… we are very glad to get help from our readers on this aspect of the project. Please feel free to reread, copyedit, and comment or make suggestions about the text that we provide. We appreciate it. As to your point about soldiers always lamenting the lack of letters from home: you hit the nail on the head exactly. It seems like it appears in nearly every letter (at least a mention of the last letter received, but often an admonishment to family for not writing more frequently!). William Ray Wells, the Union soldier that penned this letter, was particularly adept at this admonishment. 🙂 In one of his letters (which we’ll feature in a few days) he even gave a tongue lashing to his family for inappropriate use of stamps and envelopes.